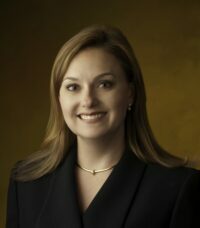 Meredith Martin serves as Of Counsel to the Firm. Ms. Martin concentrates her practice in the areas of business law, estate planning, and administration of estates and trusts. She represents closely held businesses in a variety of matters, from formation to contract, intellectual property, employment, real estate and dissolution matters. She represents individuals in estate and business succession planning, including state and federal estate tax planning, as well as trust planning, and provides professional administration of estates and trusts. Ms. Martin is a contributing author to The Intellectual Property Deskbook for the Business Lawyer, published by the American Bar Association, has authored numerous articles in the areas of business law, intellectual property, and estates and trusts, and speaks frequently on these topics. Ms. Martin has been recognized as a SuperLawyers Rising Star since 2009, and has also been recognized as a Fellow of the American Bar Association’s Business Law Section, a Fellow of the Maryland Bar Foundation, and a Leadership Academy Fellow of the Maryland Bar Association. She is a graduate of the University of Maryland School of Law, with honors, and holds an M.B.A. and undergraduate business degree, with a concentration in Finance, from Loyola University Maryland. She is admitted to practice law in Maryland and the District of Columbia, and also holds a real estate broker’s license in the State of Maryland. Ms. Martin serves on the Board of Directors for Meals on Wheels of Central Maryland, as an adjunct Board Member for Maryland Volunteer Lawyers for the Arts, as a member of the Maryland Antiques Show of Hunt Valley (benefitting Family & Children’s Services of Central Maryland), and as a member of the Alumnae Board of the Bryn Mawr School. Loyola University Maryland, B.A., M.B.A.